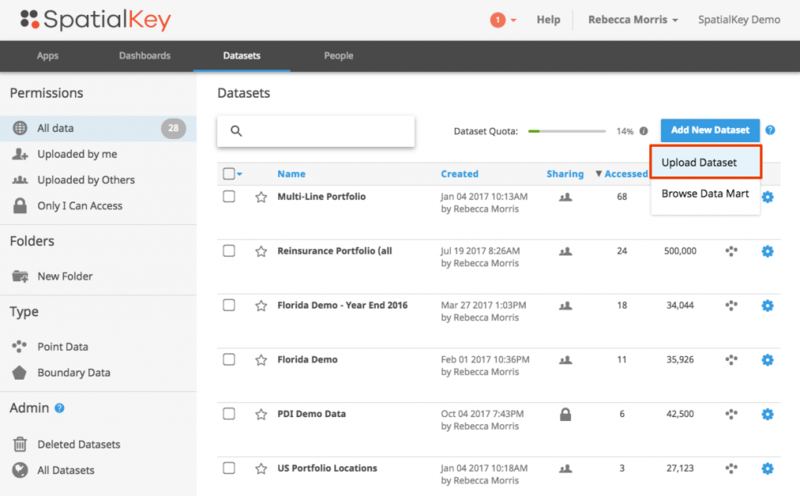 The Data Upload Wizard is the most common way to import data into SpatialKey. This article will walk through the steps of importing a dataset for the first time as well as updating or appending to an existing dataset, all using the Data Upload Wizard. We will also take a quick look at the abbreviated Data Upload Wizard available in the Flood app. If you need sample data to try it out, check out our Sample CSV Data files. The Data Upload Wizard will walk you through a few steps that will help SpatialKey learn about your data and how to plot it on a map. First, you are asked to select your dataset for upload. The screen contains links describing what files types are supported for upload and also displays your organization’s limits so you know how many records and columns are allowed for each dataset. Selecting a shapefile: If the file you select is a shapefile, you will automatically skip to the final screen to name your dataset, configure email notifications, and opt to share this dataset with everyone in your organization. 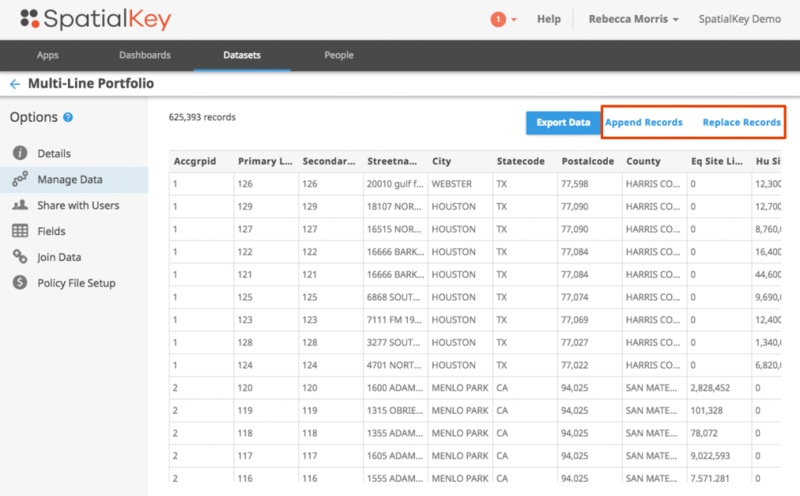 Selecting a CSV dataset: Once you select your dataset, SpatialKey will perform an initial upload of the file, so we can read from the columns in future steps. While the file is uploading, you are asked to identify whether your dataset contains a single or multiple countries, or whether it isn’t mappable. If your data cannot be mapped, you will go directly to the column setup and selection screen. Next, identify what kind of mappable information you have. Does your dataset contain latitude and longitude coordinates or does it contain addresses that need to be geocoded? You also have the option to map against other geographic boundaries if you are working with aggregated data without addresses or coordinates (e.g. you have a column in your data that identifies a country or CRESTA for each record). If you selected that you have latitude/longitude coordinates or addresses for geocoding, you will need to identify appropriate columns within your dataset. You can also “skip previously geocoded locations” and SpatialKey will only geocode those with null or 0,0 lat/long coordinates. 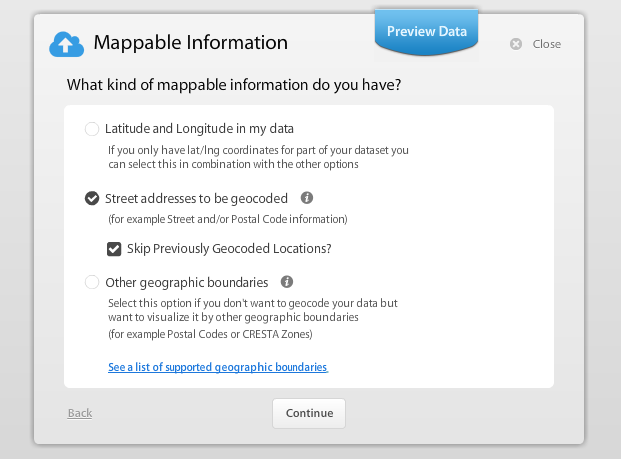 To learn more, check out this article on Geocoding Options. After identifying the type of data and assigning the relevant columns, you configure your thematic mapping options. If your organization has subscribed to our global boundary offering, you will see global boundary options in addition to the standard US boundary options (US State, County, and Postal Code). You can simply enable the available options by toggling a given geographic boundary to “Yes”, then select a column in your data, containing the boundary information. For example, if you toggle on the Country boundary, you will identify a column that contains either FIPS or ISO Country codes. Next, identify which columns to include/exclude and adjust the data types for each column as needed. This is a very important step because data type assignments cannot be changed after import. You may have noticed a “Preview Data” option at the top of all screens in the Data Upload Wizard. Click this to preview the top 500 records from your dataset at any time. This can be helpful when mapping columns or validating that you have selected the correct dataset. The final step is to name your dataset, configure email notifications, and opt to share this dataset with everyone in your organization. You are done setting up your import job! You can close this screen and continue working in SpatialKey while the upload completes. Upload a new version of your data or append additional records to your data from the Datasets tab. Click on the gear icon to view data settings and select the “Manage Data” option on the left side of the screen. Sure you could just import your new dataset again without using this feature, but you would have to reapply permissions, filters and joins, and recreate dashboards for the new dataset. Using the replace data or append data features will allow you to preserve any action that was taken on your dataset, saving you a lot of time! When changing an existing dataset, you have the option to replace or append to the existing dataset. Note that for shapefiles, the only option is to replace. After selecting to “Append more data” or “Replace all data”, you will have a chance to preview the data in the selected file before the upload begins. All settings from the original upload of the file will be applied to the new dataset.